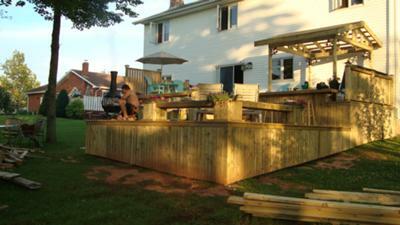 I decided to rip off the old small decaying deck and build a more roomy area for family fun. I designed the deck by drawing a plan, using 1 cm for one foot and went from there. I asked my brother law what he thought about building it for me. He agreed and we got started. We worked together at it and had a blast. I have a whole new respect for construction workers and the job they do. We worked many long hours in the heat of the summer on this deck. It was certainly worth it and to see something I designed come together. It was exactly as I pictured in my mind. I am so very happy with it. We did add more wood to the roof over the hot tub and on the bottom level we put in stones and a hammock, with another lounging area. Thank-you everyone, we do love our deck and get a lot of use out of it! 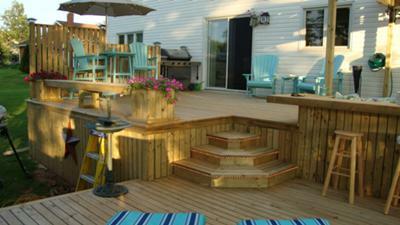 I love your deck! I'm glad for you! This deck is amazing; I love the fact that there is a hot tub you can use in the winter too and the special area for the chimea. The blue furniture is a very nice colour. Well thought out with a bar, roof, stove, lots of seating, etc. Great job! You must be satified with this excellent addition to your house. Amazing! You should start a business designing decks. I liked the different levels and the way everything blended together. Looks great! This will be nice in the winter on them cold days! Good job! I'm from California and got to see the deck first hand 4,000 miles away in PEI. That deck would rival most in California. Solid construction, well thought out, true measurements. I cant believe how great it looks and to think a sister and brother-in-law could work so hard and work so well together. The time and effort it must have taken to do this. Hope you guys win. You both deserve a vacation. Now I wish that was my deck!!!! what a great idea, there is something there for the whole family to enjoy. you guys should go into the deck building.